Are you looking for an electric grill that is easy and practical to use for gatherings and parties? If so, you are most probably considering to get either Weber Q1400 or Weber Q2400. These two products are very popular on the market. They are electric grills that are loved by many users due to the excellent cooking performance and simple operation. Between the two products, Weber Q2400 is the one that is more expensive compared to Weber Q1400. So, which is the one that you should choose? Both Weber Q1400 and Weber Q2400 are electric grills, which means that these grills consume electricity power to then generate heat to cook. One thing that people often worry about electric grills is whether they produce enough heat to actually cook steak. However, both Weber Q1400 and Weber Q2400 have proven that they are comparable to the gas-fueled counterparts, thanks to the infinite control burner valve settings. Each armed with a 1560-Watt electric heating element, they both are able to generate high levels of heat, sufficient to cook steak quickly and perfectly. However, they do come with different sizes. Weber Q1400 offers only 189 square inches of total cooking area, which is suitable for about 8 hamburger patties, whereas Weber Q2400 comes with 280 square inches total cooking area for up to 11 hamburger patties. 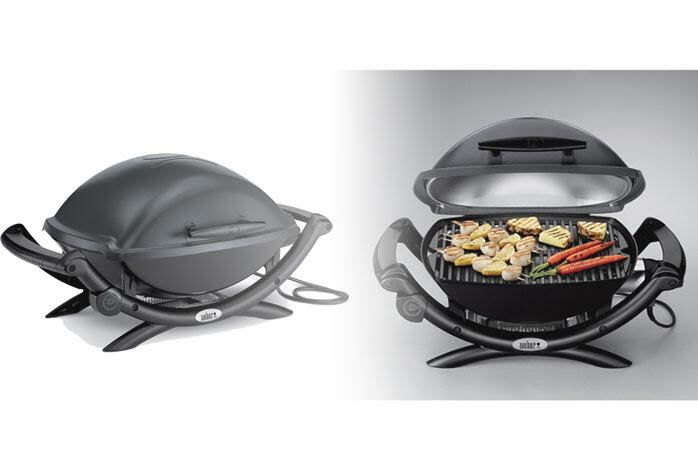 Have a look : Weber Q140 vs. Q1400. Due to the larger cooking area, Weber Q2400 is also a little bit bulkier and heavier than Weber Q1400. Other than that, Weber Q2400 indeed come with a similar design to Weber Q1400. They each feature cast aluminum lid and body that is very rugged, as well as durable porcelain-enameled cast-iron cooking grates that are very easy to clean and maintain. There is an aluminum heat retention liner that performs an excellent job in keeping consistent cooking temperatures and preventing the heat from escaping outside. Weber Q1400 and Weber Q2400 are very easy and simple to use; they both come fully assembled out of the box. You only need to plug in the grounded power cord to turn the grill on. The length of the power cord is 6 feet. You may need an extension cable to use the grill outside the home. All in all, the biggest factor that you need to consider in choosing between Weber Q1400 and Weber Q2400 is the size. If you only serve less than ten people, Weber Q1400 is sufficient. Otherwise, you need to choose Weber Q2400 instead.